Panjim, March 14: 2019 - Goa Tourism puts up an impressive show at BTL (Bolsa de Tourismo de Lisboa) in Lisbon, Portugal being held from March 13-17, 2019. The five-day event which began on 13th March is receiving an excellent response with market leaders increasing their stand size followed by participation from a cross section of global and Indian travel and tourism markets. The Hon’ble Indian Ambassador to Portugal, Ms. K. Nandini Singla called on the Goa Tourism delegation led by Mr. Sanjiv Gadkar, Director, Department of Tourism, Govt. of Goa. Ms. Singla expressed delight on Goa Tourism’s participation at the Bolsa de Tourismo de Lisboa and for setting up an attractive and impressive pavilion showcasing the best that Goa Tourism has to offer to the world. Ms. Singla who had visited Goa last year and met the Hon’ble Tourism Minister, Mr. Manohar Ajgaonkar, once again re-assured the Goa Tourism delegation of her continued support and pursuing bilateral ties between Goa and Portugal through tourism, sports and other areas. As part of this initiative, Ms. Singla also urged Goa Tourism to initiate talks with APAVT, an association of Portuguese travel and tourism agencies which could facilitate and boost footfalls to Goa in the near future. 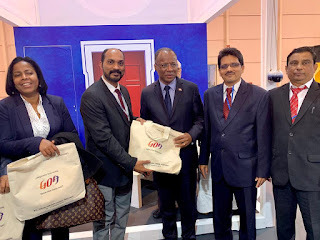 Mr. Jose Ulisses Correia e Silva, the Hon’ble Prime Minister of Cape Verde who also visited Goa Tourism’s pavilion at the on-going BTL, Lisbon, showed keen interest in Goa as a tourism destination having a plethora of facets. He expressed his desire to engage in bilateral relations for an exchange of tourism ties between the two regions. Mr. Deepak Narvekar, PRO – GTDC & Mr. Gajanan Mahale, ATO – Dept. of Tourism were also present during the interactions. Goa Tourism has set up an attractive pavilion at the BTL, Lisbon showcasing all its new tourism products and services , organized presentations and interactions with bigwigs from the tourism industry which received tremendous response from international buyers, tour operators, travel agents, wedding planners, corporate travel decision makers, potential investors in the field of hospitality, leisure and travel industry. Several bloggers and travel writers visited BTL and obtained information on Goa Tourism services and other facilities. Goa Tourism officials are engaging in B2B meetings and are networking with prominent tour operators during the event. Many bloggers have also visited the Goa stall. A Goa Evening was also organised which was well attended by travel and tour operators, media, visitors and other dignitaries .Goa Tourism’s pavilion was designed and managed by Mr. Elvis Dias of AMO .